Welcome to Thermocline Lures, your online source for the best hand crafted fishing tackle available. Our goal is simple – To help you catch MORE & LARGER fish. With this objective, we are constantly working to provide the color & glitter combinations that fish cannot resist. You’ll find that your satisfaction and success is our primary focus. We’d love to hear from you to let us know what we can do to better serve your needs! Thanks for visiting our site and please check back often. 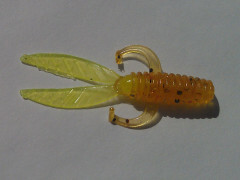 We will continue to update our products with exciting color combinations and new lure designs. Summer Grasshopper and Baby Blue Glimmer were very effective today. The fish on Lake Cypress Springs love our baits! The crappie were hungry for Thermocline lures! Our bass lures are coming soon. Please excuse us while we focus on developing our crappie lineup. Please check back soon!